Villawood AMF Bowling and Laser Skirmish is the place to be for a cheap, fun filled evening for the family or group of friends. As soon as you enter this establishment your ears will be buzzing and your eyes boggling at the large assortment of old school arcade style games, as well as the loved classic feel of the bowling lanes. Fans of the nostalgia will be flocking in numbers to remember the golden days of their youth. The bowling alley also offers a disco session at night to enhance an already gobsmacking experience. I ask myself what could be better than bowling with a disco ball shimmering to the sounds of the late great Michael Jackson? Well, do not fear new age technology lovers, there are plenty of sights for you to behold and experience at this impressive location. 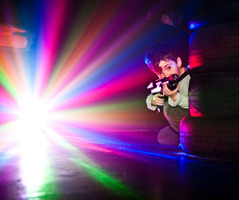 Picture yourself running through a maze of walls, labyrinth style, using stealth, speed and vision to score points in a festivity of laser shooting action. This mind blowing invention can be experienced by young, old or even both, on a team or in a free for all frenzy of violence, without the pain. Points are incurred throughout by shooting an enemy in the shoulder, back or chest as everyone wears a contraption of lights that indicate the targets. At the end of the session you will be given score sheets so you can brag to your mates of your overwhelming dominance or find the nearest hiding spot to avoid the humiliation of defeat. I must say that the experience of being in a real life Call of Duty or Counter Strike map in warfare is an experience that is difficult to describe. So my suggestion would be to get off your chair after reading this article, shut down the computer, get changed, get on the phone to your mates and get down to the venue and let the war begin. I purchased two games of laser skirmish and one game of bowling for around $25, which led to around 4 hours of fast-paced, ankle twisting and sweat inducing fun. With hot food, snacks and drinks on offer at the venue at a very reasonable price, the night was complete without me having to frantically search for the nearest fast food joint. I will definitely come back to Villawood AMF Bowling and Laser Skirmish because it was some of the most fun I have had in years, it made me feel like a little kid again and that experience is priceless. Plenty of parking is available on sight, however depending on where you are coming from it can be a little tricky getting to the venue as it is located in a factory-like pocket of space. I would suggest having a sharp eye next to you while you drive or you may find yourself going in circles around where you actually should be. This is the only downfall to an otherwise essential part to an epic night. So why would you pass up the opportunity to experience something new, something old and something in between? Experience the best of all generations of entertainment and allow your scores to speak for themselves as the family and/or friends witness your greatness. Been there too ! He's a gr8 writer and knows his stuff !!! !